With roots tracing all the way back to 1888, Rainier Fruit Company has become one of the nation’s largest growers of organic apples, pears, cherries and blueberries. Located in the heart of Washington’s Yakima Valley — one of the country’s most productive growing regions for apples, wine grapes and hops — Rainier has leveraged the Northwest’s fertile soil into a fully integrated growing, storage and packing enterprise. The company is one of the region’s largest producers of organic blueberries. By planting various varieties of blueberries, Rainier’s organic blueberry season extends from June to September. Rainier primarily distributes its organic produce directly to retail customers throughout North America. “By utilizing controlled atmosphere storage, we can extend our organic apple season to about 10 months. This allows us to fresh-pack apples as customers order them throughout the season,” says Zirkle. While the Zirkle family heads up Rainier, the fifth-generation, family-owned company is actually the sales and marketing arm of seven Washington fruit producers who teamed up in the 1970s to cut distribution costs. 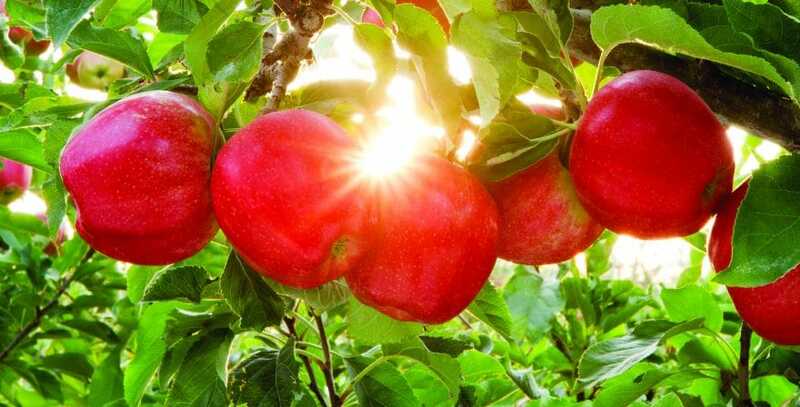 But the seed that would grow into Rainier was planted almost 100 years before, when Zirkle’s ancestors moved to Washington from Virginia’s Shenandoah Valley and started growing apples in 1888. The family found early success growing apples in the Northwest’s amiable climate, but had to start back at square one following the Great Depression. “In the 1940s, they bought up a lot of land and that was the genesis of things,” says Zirkle, a fifth-generation member of the fruit company. Rainier soon joined a cooperative, packing its own fruit for other companies before striking out on its own in the 60s and developing an in-house brand. The company found success in this model and steadily grew over the years to become one of the region’s largest fruit producers, but it was the arrival of Zirkle in the early 2000s that set Rainier on its current trajectory. Zirkle grew up in Rainier’s orchards, picking apples in the fall and packing boxes during the colder winter months. He worked in nearly every part of the business before setting off for college, earning a business degree before returning to the company to relieve his father of the top position. “When I came in 15 years ago organics were a tiny thing, but I started becoming aware of what generations value and what people wanted and it was changing,” says Zirkle. Rainier soon began experimenting with organic growing methods and was impressed with the early results. While the organic crops meant a lower yield per acre for Rainier’s growers, the company no longer had to worry about purchasing and applying organophosphates, pesticides and other chemicals and soil additives. Most importantly, the fruit tasted better. “The uptake of nutrients is more natural and progressive, so the fruit tends to not be as big, but the flavor and earing is better due to the way it grows,” says Tudor, who grew up on a Washington farm and cut his teeth with the U.S Department of Agriculture and another fruit marketing company before ending up at Rainier. Rainier began to rapidly shift its production from conventional to organic; quickly learning important lessons about biodiversity, soil quality and other benefits of the organic approach. “We started putting things back in the soil that hadn’t been there with the chemicals,” says Tudor. Organic growing is not without its drawbacks. The strict guidelines, which must be followed to ensure that every Rainier product ends up with a little USDA-certified organic sticker on the side, can be cumbersome at times. “There are people who will come into the market trying to chase a dollar, but we made the commitment 15 years ago because we knew it was the right thing to do. We want to be the best stewards of the land possible,” he adds. While Rainier was built on the back of familiar apple varieties such as Red Delicious and Golden Delicious, it’s the company’s Gala, Fuji and Honeycrisp lines that are driving sales today. The company has also developed two of its own proprietary strains; the Junami, brought over from Switzerland and adapted for the Northwest climate, and Lady Alice, named after Zirkle’s grandmother. “The design of the ‘Green Line’ further allows us to fresh-pack organic apples to customers’ specifications and package requirements,” he says. All of Rainier products are USDA -certified organic, an expensive and time consuming, but ultimately worthwhile process that guarantees the company’s products will command the highest possible price among retailers. The company went through a three-year verification process to earn the certification, which involved extensive soil and fruit testing and lower overall production. While the entire operation achieved organic certification, the team at Rainier decided to focus on embracing the process for the company’s more marketable varieties. “We transitioned Galas, Fujis and Honeycrisp into organic, but there’s not really a financial reward for a grower to grow the older varieties organically because when you think of who’s buying organic apples generally , they’re not buying Red Delicious,” says Tudor. Like many in the seasonal produce trade, Rainier uses the U.S. Department of Labor’s H-2A program to hire foreign workers on a temporary basis, guaranteeing that a dearth of local labor won’t leave a season’s harvest rotting on the trees. 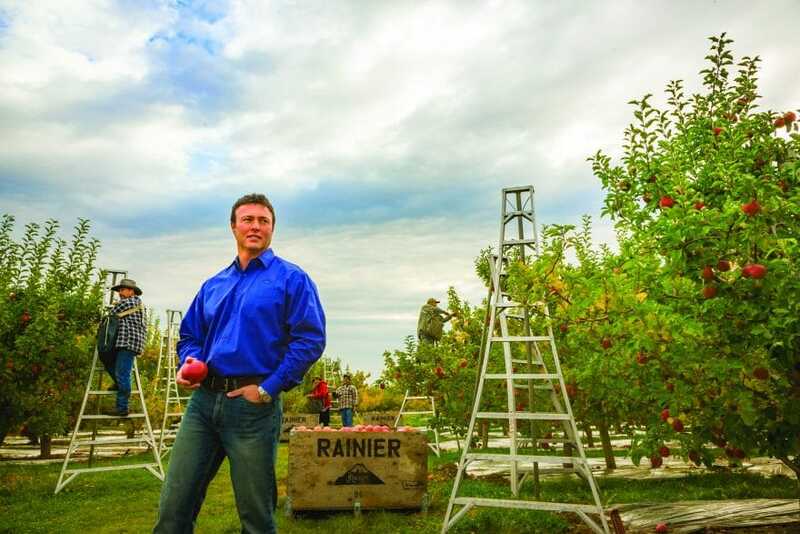 Rainier is constantly cycling fruit in and out of production based on consumer habits, replacing 10 percent of its orchards each year to keep up with the latest trends in the produce market. Right now that means expanding the company’s line of organic products and exploring newly health-enlightened markets in Australia, Southeast Asia and the Middle East. The company is currently struggling to meet consumer demand for its organics products as the entire category continues to explode. “It’s growing worldwide; we’ve seen double digit growth in retail for organics for every year except 2009,” Tudor says. For Zirkle, success is measured simply in what falls from the tree or bush. “Our goal is to grow the best fruit for our customers, but what separates us is our willingness to make change; if there’s an apple that doesn’t sell or people don’t like it, we’ll get rid of it and try another,” he says. As one of the Yakima Valley’s leading fruit producers, Rainier plays an active role in the community, running a year-round toy drive for Toys for Tots that saw 1,400 donated this year alone. As part of the new relationship, the 500,000-plus runners and spectators at the Boston Marathon will be able to sample Rainier’s “Rising Star” apples — including Lady Alice, Jazz and Pink Lady — at kiosks throughout the racing route. In future years, Rainier will work with regional and national retailers to develop in-store promotions highlighting the partnership as well as introducing new tools and resources for health-conscious consumers. With over 100 years in the industry and a strong presence in one of the country’s most fertile fruit producing regions, Rainier Fruit Company will remain an industry leader while pushing the envelope to introduction organic produce to a new generation of consumers. Showcase your feature on your website with a custom “As Featured in Terra Firma” badge that links directly to your article! We were very pleased with the outcome of the article when Terra Firma featured our company in their online journal. Everyone at Terra Firma was very professional, and they projected our family's business exactly the way we intended it to be. We would highly recommend working with this fine company! — Brian Winner, President, Robert Winner Sons Inc.
We are completely satisfied with the article published by Terra Firma. The process was smooth from start to finish and their representatives guided us through the entire process. I would recommend partnering with them to showcase your business. Terra Firma profiles leaders and emerging businesses in the North American food and agriculture industries. It’s premised on the idea that, despite providing a vital service to our country, farmers and the businesses connected to them—including distributors, food processers and manufactures, feed companies, and the like—get very little credit or media coverage. Terra Firma seeks to correct this oversight. Get Terra Firma straight to your inbox.